I didn’t mean for this to be a complete makeover post. My plan all along was to blog as we went about updating the furniture in our combined living/dining room. But by the time I could catch my breath last spring and update you on what was happening, it felt like we were a little too far down the road already to bring you up to speed. Then the final few pieces took forever to come into place and now here it is well over a whole year after we started this project and I am just getting around to telling you about it. I can feel your shade. But the good news is that now you get complete before and afters. Everyone likes those the best right? Ok, so here we go. Here’s what we had for furniture before we started reinventing this space. Most of these pieces came with us from Hawaii and mainly the problem was that they aren’t the right size or scale for this house. But they functioned and there were bigger fish to fry, so we lived with them. Much better no? I wish I could take credit for this all by myself, but the truth is that I enlisted help. I heard about this company called Home Polish that provides non-traditional home decoration and design services. What I liked about their business model is that one of the services they offer is a “one-day consultation” that is just a design consultation, they don’t actually buy any pieces for you. You pay a flat fee for the consultation, with the option to add additional hours of service at an hourly rate. Our one-day consultation was actually more than one day. We did an introductory phone call that lasted about 30 minutes and then the designer came to our house and spent about two hours with us talking through the space and giving us layout options, furniture suggestions, window treatment ideas, and general design advice for things like our built-in bookshelves. She then followed up with an email with a bunch of links to the things she suggested, but no pressure to buy! We found that amount of time and resources was the perfect amount to help us with our living/dining room and we took her ideas and ran with them from there. Some of the pieces we ended up with were the exact pieces she suggested and others I found on my own using her advice on style, structure, size, etc. as a guide. All of her advice was very practical and useful. It was just what we needed! If you are in a city where Home Polish has a presence, I would highly recommend them. 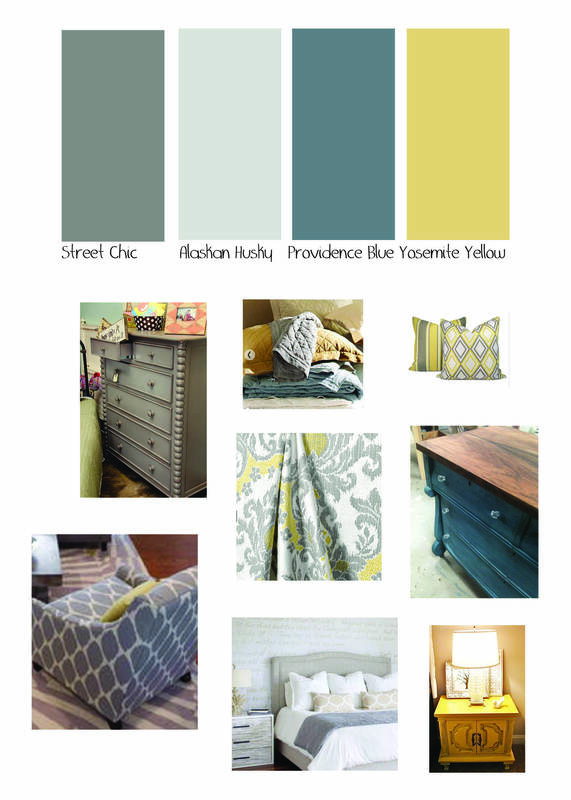 When we met with our Home Polish design consultant, we told her what furniture pieces we wanted to keep and what we wanted to refresh. Basically we liked our dining room table and our coffee table, everything else was negotiable. I had already purchased an IKEA KARLSTAD sofa because it was being discontinued, so we technically already had the couch picked out as well but we were not yet using it. The pieces that we bought were these chairs, this rug, this floor length mirror, these new curtains (in a cream color that I don’t see on the website currently) and these new woven shades, this long, narrow console for the stairway wall, this side table, this standing lamp, this console for the wall in the dining area, and this media cabinet. Regarding the art and décor pieces, the painting above the console table is a custom piece done by a dear friend, Mike Caplanis. Since we have a gallery wall of photographs in the stairway, I really wanted this wall to have one large piece of art. The paddles on the wall came from Island Paddler in Kailua, Hawai`i. The lamp on the media cabinet is from Home Goods and the tall vase is the Bead Pure White Ceramic Vase from West Elm with some branches I grabbed from the yard. The decoy duck was a thrift store find and I believe the other décor pieces are from Target. Many of the furniture pieces are from West Elm and I think the main reason for that is that many of their pieces have the right proportions for our modest size home. I love alot of the furniture from Pottery Barn, Restoration Hardware, Room and Board, etc. but I found when really looking at the dimensions of the pieces that I was interested in, many of them were not the right size for my space. We purchased most of the large furniture items between November of 2016 and February of 2017 and then spent the spring, summer and fall adding the finishings. I would still like to replace the rug at some point, but I am not 100% sure what I want. Why are rugs so hard? The recessed lights have also been a major upgrade.Due to the position of our house and the large amount of mature trees in our neighborhood this room doesn’t get a good deal of natural light, especially in the afternoons in the summer when the trees are full and the sun is at the front of the house, so having some extra light in here during the day has been great. We used these light bulbs with a 3000 kelvin rating to simulate the feel of natural light as best we could and the lights are all on dimmers so we can control the amount of light we are using. For the lamps we use a warmer bulb as we now typically only have those on in the evenings for ambient and reading light. Two more things I will call your attention to are the addition of cabinet doors to the bottom of built-in bookshelves. This was something I had been thinking about since we moved in and was also one of the first things the Home Polish consultant recommended well. It provides both some really usable storage (since we lost a little bit when we replaced the two chucky china cabinets with smaller and more-open pieces) as well as visually cleaning up the room a little bit. I like it so much better. We got the doors custom from Cabinet Door World and the hardware the 6″ Durham Pull in satin brass from House of Antique Hardware. So that’s basically what we have been up to for the past year or so. It’s been so rewarding to transform the space in our home that we use the most into one we really love being in and that reflects our style and the things that are important to us. As the weather turned colder, we also are really loving our gas fireplace. It’s such a luxury, I can’t believe we have it! I am not 100% sure where what we are going to set our renovation eyes on next. Our master bath is definitely a contender, but a pricey prospect so we will see if anything else jumps ahead of it yet again. Every year I say this is the year of the master bath, maybe 2018 will be it. Either way, I promise to post more frequent updates this year! Hi Everyone! It’s been awhile since I checked in here, so I wanted to stop by with an update, sort of. I wish I could report that there’s been alot going on behind the scenes and that I have alot to share with you coming up soon, but that’s just not the case. While our adventures in tiling did knock us off our DIY game, that’s not what’s holding us back. We are again trying to save up some money for some larger projects such as a new driveway and garage door and a decor reset in the living room. I am also pinning black and white bathrooms whenever I see one I like in the hopes that one day our “master ” bath will finally get a spin in the reno machine. Isn’t this one lovely? 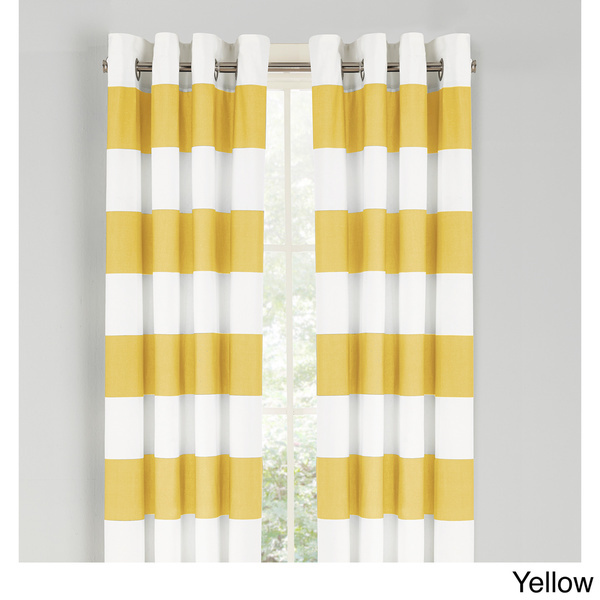 We are thisclose to FINALLY completing our master bedroom, which I made good progress on about a year ago and then have just stumbled to the finish thanks to some curtain drama, cold weather, and laziness. But we are almost there, so I am trying to ride this one out. If you take a picture from just the right angle, it looks done! So that’s really all there is to report. We are still loving our kitchen and sun room, we use both all the time. That mini-split AC/heat system that we installed has been fantastic and we really recommend it for spaces like that. It heats and cools really well and is so quiet. I hope everyone is surviving winter, whatever that may look like for them. I for one am looking forward to spring! Apologies for not being around the past few months. We took the summer off from home stuff to relax and let our bank account recover from the big kitchen reno. In the fall we started back in on some projects, namely working more on our master bedroom, which is coming along but is still not done, and adding a tile backsplash to the kitchen. Both have taken longer than expected, but the kitchen is finally, totally complete! Here’s the down low on our experience with tiling a backsplash. If that’s all you need to know. Here’s how the kitchen looks now. If you’re interested in some details. Here they are. Prior to this project, neither of us had every tiled anything before, but we had seen so many other DIYers do it, we were confident that this was a project we could handle. We went to The Tile Shop because we had heard good things from friends and other bloggers and got some samples. 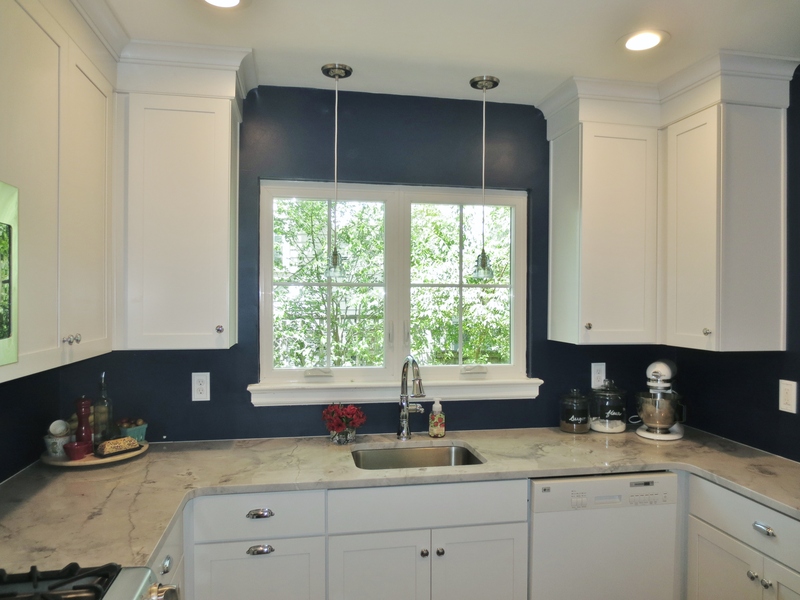 We decided to go with the 2″ wide Hampton Carrera marble hex. I thought that the more round pattern would be a nice contrast to the squareness of the room’s layout. I also thought that it looked best with the quartzite counters. We went back to the Tile Shop and gave them our choice and our dimensions and they hooked us up with literally everything that we needed to do the job ourselves. Their website has how-to videos and they do on-site classes as well. Admittedly, I didn’t do as much research on the process and I normally do. Almost all of my favorite home bloggers have tiled something before as so I have read about the process many times, but I didn’t go back and re-read much before we got started. Mark had read up a bit, and since we had heard that the process was fairly straightforward, we weren’t very worried. We started the project by removing everything from the counters and killing the power and gas to the outlets, stove, and microwave. Then we pulled the stove out so that we could tile around it. We also added a layer of cardboard over the paper covering on the counters so that the tile would not sit directly on the countertops. This step was a part of every “how-to” we researched. What we didn’t pay any attention to was the thickness of the cardboard. This proved to be a costly mistake. The day we were set to start this project we randomly didn’t have any cardboard boxes laying around, which is weird for us given how much stuff we order online and have shipped. So we bought a moving box at Home Depot while we were dropping off our paycheck picking up other supplies. This was a heavy duty box and the cardboard was about 1/4″ thick. We didn’t realize at this time that that would be a major problem, so let’s keep going for now. After we put the cardboard down, we mixed this first batch of thinset and, starting in once corner and working from the bottom up, applied the thinset to the wall and then gently placed the sheets of tile into the thinset and sort of massaged them into place. As we went along we got better at both applying the thinset and also getting the tiles worked properly into place, but in general it’s not that tricky of a process. The math and angles that you have to calculate to deal with things like corners, outlets, etc. is a bit more challenging, but if you passed 9th grade math, lack a crippling case of dyslexia, and have a small amount of patience, you can figure all of this out. I don’t claim to meet these criteria, but Mark does. It took us about 7 to 7.5 hours on a Saturday to get all the tile laid. Then everything had to sit for 48 hours to dry before we could move onto grouting, so it was Monday evening before we could start that process. We mixed the amount of grout they gave us in two batches. The first batch was the right consistency, the second was a little more wet and took a bit longer to set up. Wet grout is much darker than dry grout. You can see from this picture that the grout looks grey. But here is what it looks like dry, almost white. Once the grout was dry, we came to the disappointing conclusion that we need to apply a second coat. The tile still stuck out farther than the grout in many places, and there were even a few holes that needed to be filled. Not only did this mean more work, but it meant another week without a functioning kitchen, which we were not planning on. So the following weekend, we went back to the tile shop and got more grout. We applied the grout on a Saturday and again, had to wait until Monday before it was dry. In being more careful not to wipe too hard with the wet sponge to remove the grout from the tiles, many of them were hazy with grout when dry. This meant several evenings of scrapping and buffing many of the individual tiles to get this clean and gleaming before we could apply the sealer. There are chemicals you can apply to do de-haze the tile for you if you are using glass or porcelain tile, but since we were using a natural stone, we had to use elbow grease. By this point, both Mark and I had decided that we wish we had left to the professionals. We didn’t think we were doing a very good job and it was taking forever. But there was nothing we could at that point but forge ahead. After cleaning up all the tiles, we applied the sealer one evening and it was dry by the next day, which we thought at the time, meant that we were on the home stretch. All we had to do (we thought) was remove the cardboard from between the tile and the counters, run a bead of caulk to connect the two, touch up the paint where needed and Viola! We would be done. Since our cardboard was so thick, we had a massive seam to fill. We ignored this gap and tried to caulk it anyway. It took a ton of caulk and looked pretty crappy. I was willing to live with it, but Mark was not. By the time I got home from work that Friday, he had ripped it all out and had a new plan. We decided to find some 1/8″ thick cardboard and try and to grout “down” a bit to lessen the thickness of the seam. We still had some leftover grout from our second round of that process so we tried that and it seemed to work. Once it was dry enough to remove the cardboard, we removed it and were able to run a much smaller, and easier to apply, bead of caulk to connect the counters to the tile. Since we had to buy new caulk after using all we had on the first go-around, we also decided to try a grey caulk with a “sand” consistency rather than the white silicone stuff we used the first time. This looked much better! 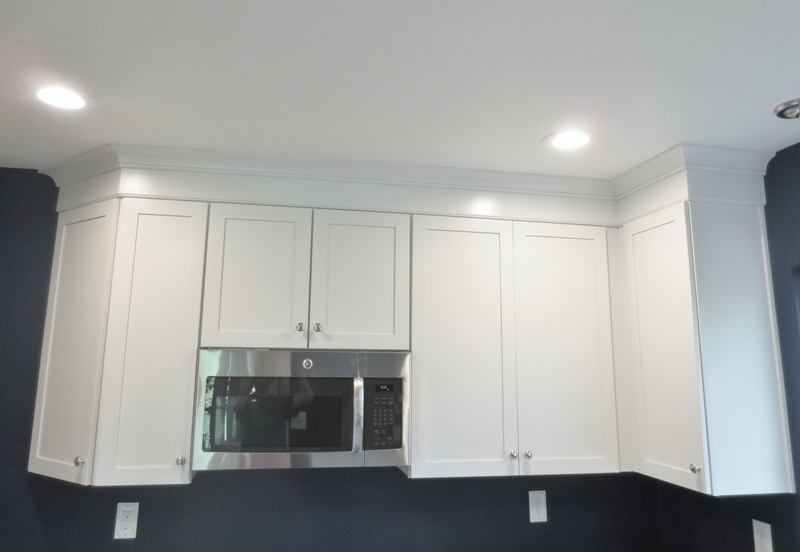 Once we had the seam caulked, we were able to start putting the kitchen back together, which I was so glad about. We had family coming for Thanksgiving and I was eager to start getting the house back in a livable condition. At this point we were only about a week away from Turkey Day. So as I said at the top, this was not a fun job and we still wish we would have left it to the pros. While we were able to correct most of our mistakes, it’s in no way our best work. From far away, it looks ok, but up close you can see our amateur effort more clearly. You can also see from the photos above that we also added in some floating shelves where we had DIYed some other shelves before and added a bamboo shade over the window. After hosting my first Thanksgiving this year, I can report that the kitchen continues to be a much more functional space than it was previously in addition to looking alot better as well. We are laying low this weekend after a really insane couple of weeks. I apologize for leaving you all hanging for so long on the kitchen reveal. I really didn’t mean to. We got everything pretty much done the day before my parents came to visit over Memorial Day weekend and then from there it’s been one crazy week after another in terms of work, travel, etc. Throw in the fact that Mark’s computer bit the dust so he’s been using mine for schoolwork and well, there you have it. Again, I apologize. So we’re pretty much trying to stay off the grid this weekend and allow ourselves the chance to catch our breath and re-group. 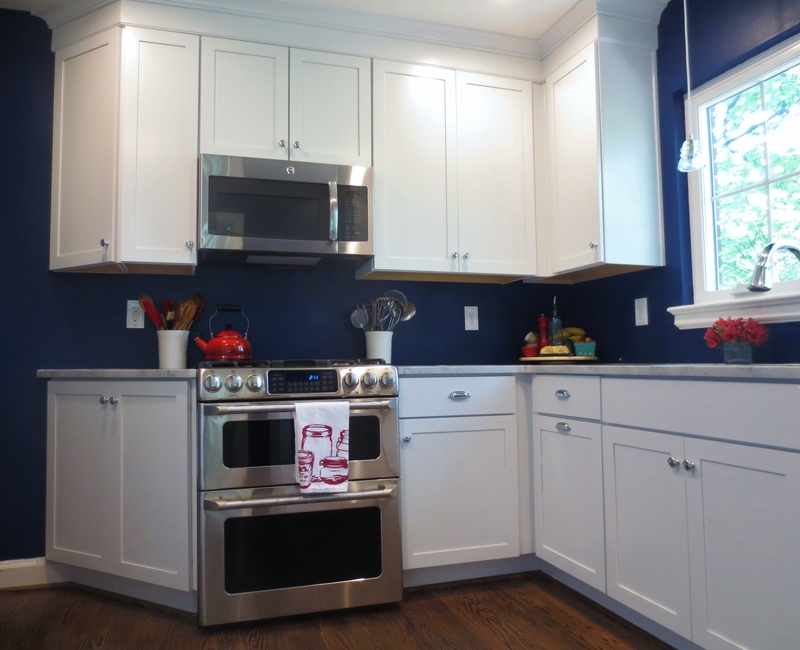 But I am thrilled that the downtime is allowing me to finally share with you the kitchen reveal! So as you may have guessed, the kitchen is *basically* complete. We still need to install a backsplash, but pretty much everything else is done and I could not be happier with how it all came out. What do you think? I did my best with the photos. The room is so small and it doesn’t get the best light, but I am in love how it looks and the functionality. It’s exactly what I wanted and I am very happy with all of my choices. But since you asked (you did ask right, Internets? ), here are a few random thoughts on everything. There’s no real order to this so we’re going bullets. I am pleasantly surprised that the shiny chrome hardware doesn’t show fingerprints. I haven’t had to wipe them down once! The new range is amazeballs. So much better than what I had. The burners have so much more power and the griddle in the middle is very useful! Ditto for the venting. I haven’t really put this baby through its paces yet, but it did a great job with the onion smell as I caramelized two big onions over Memorial Day weekend for our burgers. It was also super awesome to be able to be using the broiler on one oven to melt cheese on the burgers while I kept the buns warm in the other oven. Seriously the double oven is so clutch for holiday meals. Being able to set each and every pot and pan I used completely flat in the new, single bowl sink made washing them so much easier! This set up above the fridge is so much more convenient that storing any of this stuff by stacking it in a cabinet. Just grab what you need and go! 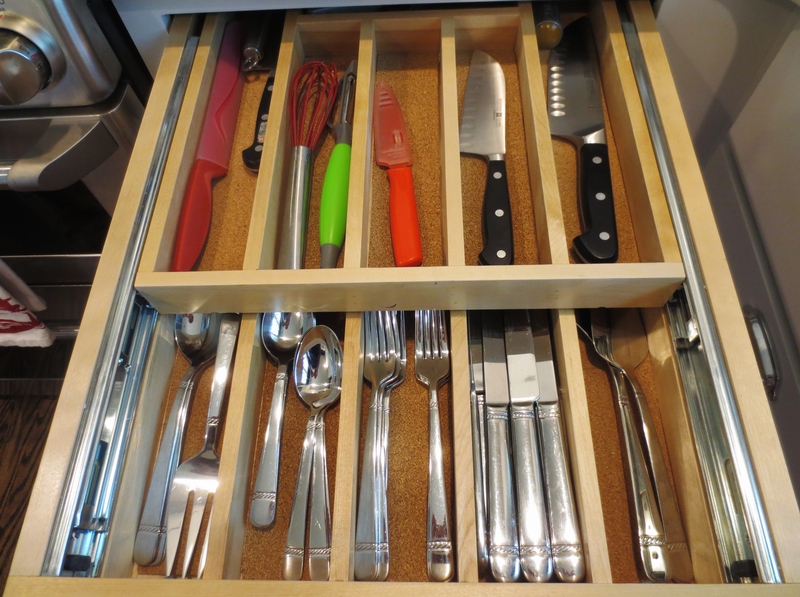 Although it is a tiny bit tricky to load all the silverware into the lower level of this drawer without it obstructing the upper drawer, the added storage is so nice! 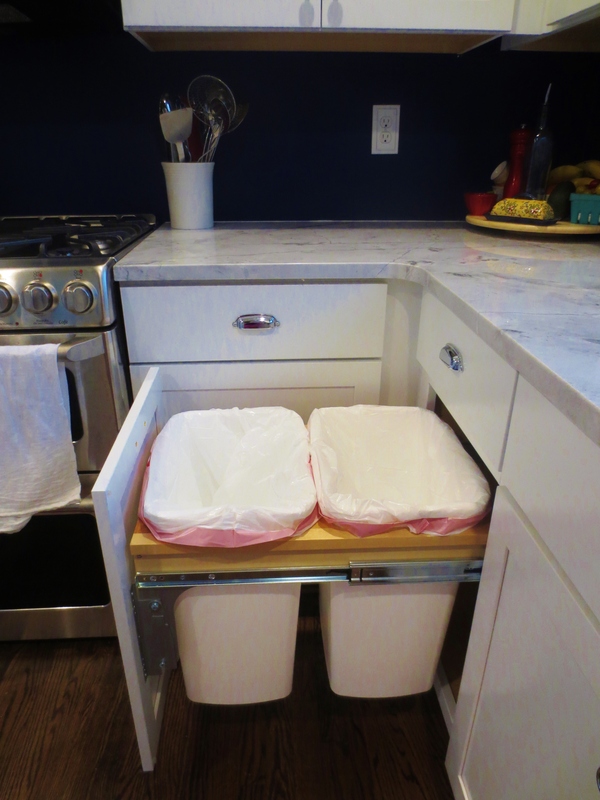 And last, but certainly not least, we have the pull-out double trash cans. So convenient I can’t stand it. Before my trash was all the way over to the left of the stove and transferring wet/messy items from the sink or counters was a pain and usually resulted in something falling on the floor. Now I can wipe the counters where I do most of my food prep directly into the trash by pulling the cabinet out. And scraps in the sink are a breeze to transfer as well. It’s love I tell you. I think the biggest surprise for me has been how much more functional this kitchen is now. Considering that we didn’t rearrange any plumbing or appliances, I am amazed at how much more counter space I have as well as the fact that there really is now two separate work stations. Adding the small counter area on the sun room wall really allowed for that and it’s a huge plus! So that’s the big reveal. We have decided on a backsplash, but I don’t think we’ll have time to tackle that project anytime soon. Maybe over the winter? We would also like to add some open shelves on the wall above the counter in the photo above at some point. It just seems that our schedules aren’t allowing for much DIY these days. But fear not, we have made some changes/progress in our master bedroom and I look forward to sharing those with you soon. In the meantime, have a wonderful holiday weekend! 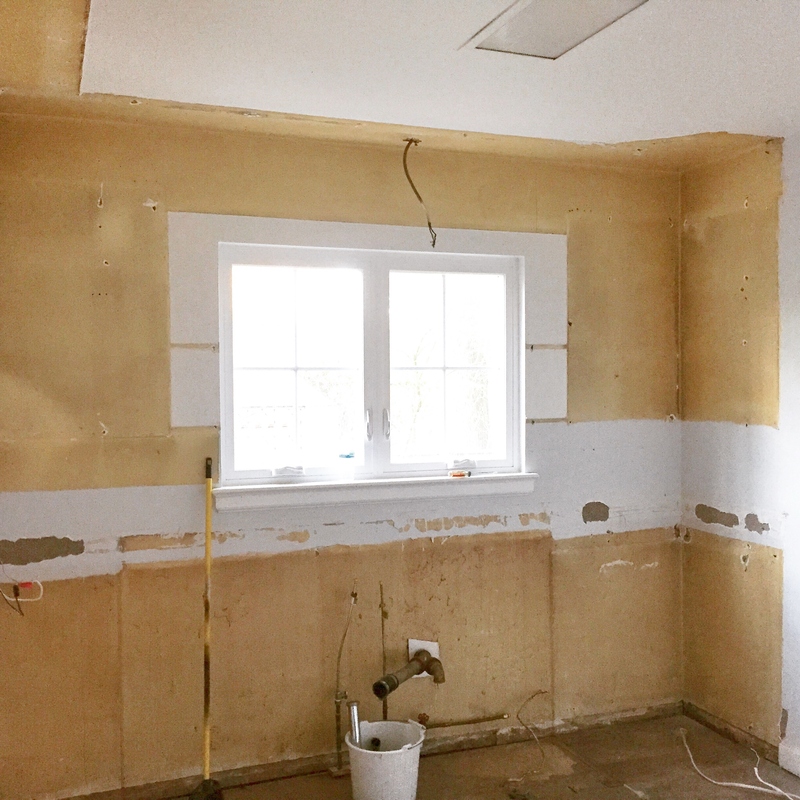 It wasn’t easy, but we’re almost through the kitchen renovation. When last we checked in, the space looked like this. It so wasn’t good. After the contractor failed to do the work the week we had agreed upon, he kept trying to take shortcuts and compress the timeline in order to stay on schedule for the counter measuring. But we weren’t about to comprise on the quality of the work to accommodate his schedule, so we stood our ground. 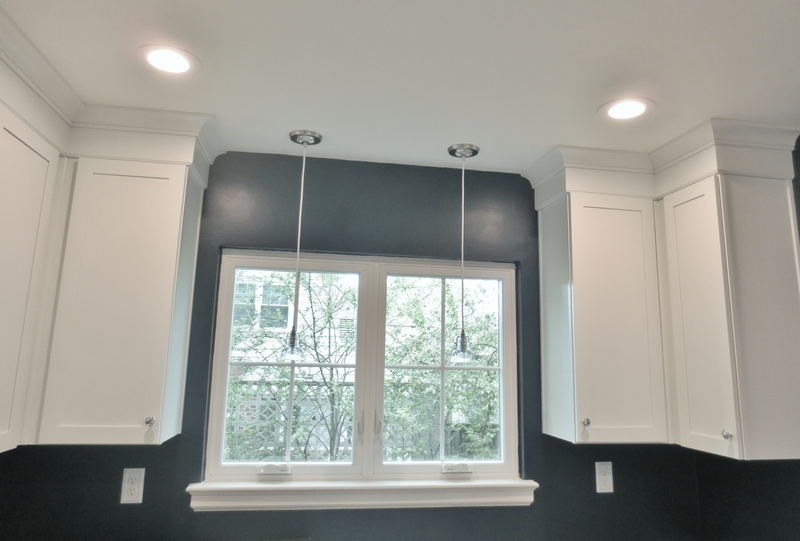 This meant that the counter measuring appointment had to be pushed back and the whole job continues to be a week behind schedule, but at least the drywall work and HVAC were done properly and we were able to paint before the cabinets were installed. I wasn’t able to update the blog last weekend as Gretchen, our older pup, suffered a rash of seizures early Saturday morning. She start having occasional seizures about 3 months ago, and she’s been on anti-convulsion medication, but something happened on Saturday and she started having a seizure every hour at first. It took the vet all day to get them stopped and the meds they gave her have pretty much had her down for the count all week. Don’t worry though, Gretchen is a tough ol’ bird and she’s going to be fine. We don’t know what’s causing the seizures and are considering an MRI to help determine the cause, but for now, she’s on more meds and seems to be doing better. Whew! So anyway, most of the work detailed below happened not this past week, but the week before. The rest of the trade work was completed on Tuesday of that week. Wednesday was a non-work day for the contractor so we had Tuesday night and Wednesday night to prime and paint both the ceiling and walls. 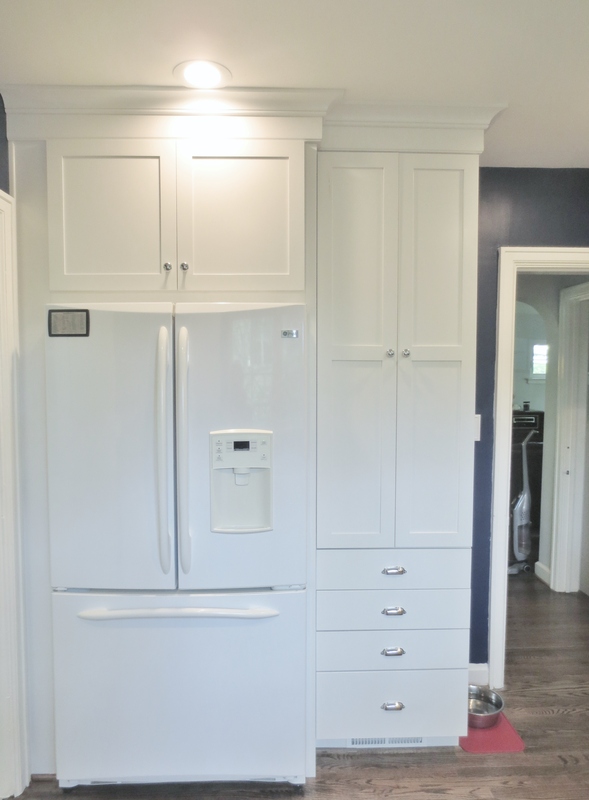 Thursday and Friday and cabinets and hardware were installed. I didn’t know that they were going to install the hardware and I was a little frustrated that they didn’t consult me on the location of the knobs. I would have placed them in a slightly different place. They look fine, but I would have appreciated being consulted. The cabinets look great. 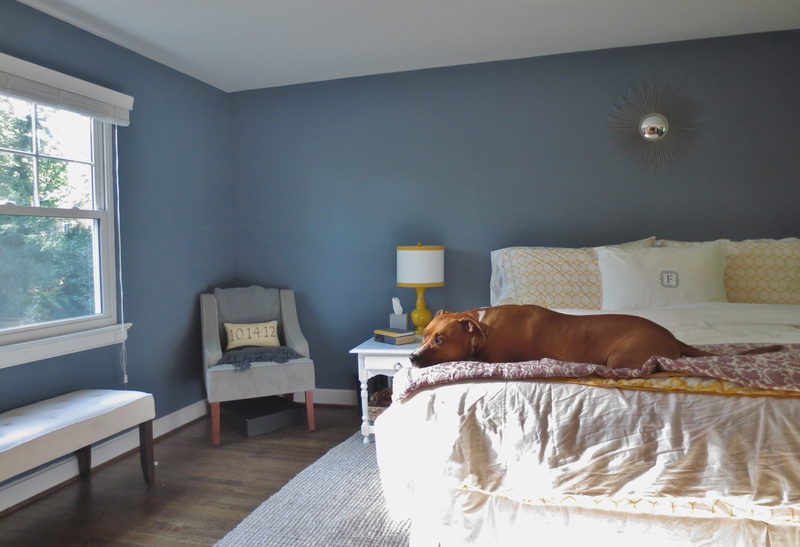 Against the “Zuma” blue wall paint, they really pop and I don’t think that they feel out of place being new in our old house. We were told that we could go ahead and start putting things back in the uppers, but that the lowers need to remain empty until the counters are installed. However, I am impatient and have pretty much gone ahead and put everything back in all the cabinets. My parents are arriving for a visit this Friday and I just didn’t see how I could get it all done if I waited for the counters to be installed first. Speaking of the counters, they are set to be installed this Tuesday. They will install the sink and the faucet, but they won’t actually hook all the plumbing back up. Allegedly, our contractor is going to be here on Thursday to do all the plumbing, which is cutting it awfully close, but I’ve come to expect this from him. 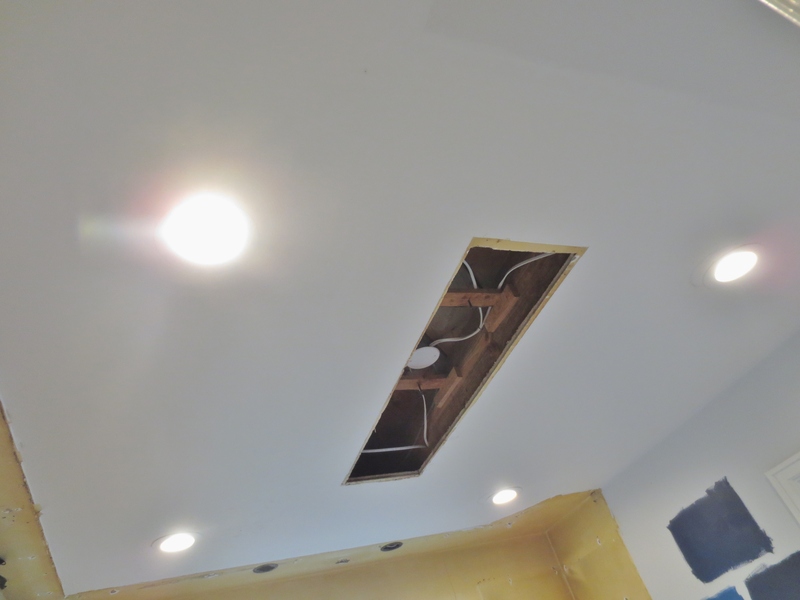 In fact he still hasn’t even ordered the under-cabinet lighting, something that has been in the plans for this project since the beginning, so I have no idea when we will actually be fully done. Grr! We still also have to install the range and the dishwasher once the counters are in place so I think there will be a few more late nights this week as we try and at least get the kitchen functioning again by this weekend. The contractor was at least able to install the micro/vent. It’s a very fancy microwave that at this point, I have no idea how to work! Today Mark and I got the fridge back in it’s place. We both think that it looks so much better with the cabinet built around it than it did when I was just free-standing, although it is in exactly the same place. What do you think? So far we are really loving all our choices and can’t wait to see how it all comes together. For the counters, after they came and measured, they sent two template proposals to choose from. As I mentioned, the stone has some natural tan tones in the upper right hand corner that I wanted to minimize visually in the kitchen and the two layouts allowed me to select the one that I thought did the best job of doing that. 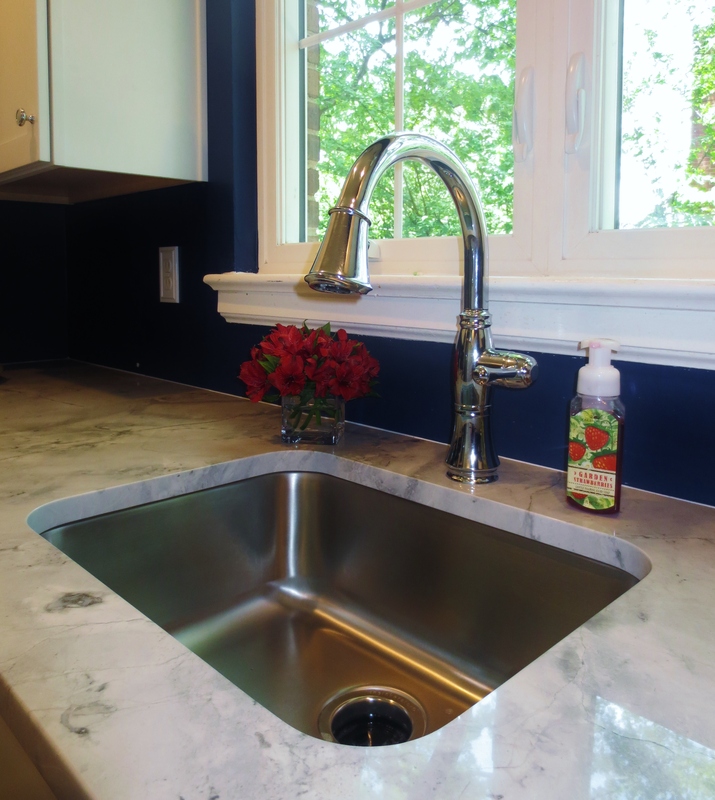 Unfortunately, there will be one seam to the left of the sink, which isn’t ideal as it’s my primary work area, but they weren’t able to put it on the other side of the sink because you can’t have a seam above the dishwasher and the slab isn’t long enough to place it anywhere else. I am ok with this, but I did make sure that this was my only option. It never hurts to ask! So that’s where we are. I am getting very excited for the finished product. Although there have been some delays, things have moved along so quickly it’s hard to take it all in. I really hoped that tonight I would be able to share with you pictures of great progress in the kitchen, but alas it still looks pretty much like it did last weekend. This was not supposed to be the case. We should be all ready for cabinet installation, but our contractor had other jobs lined up this past week and was only here one day. We are not happy campers. On Tuesday, the electricians did show up and they did a great job installing the pot lights, adding new outlets, and bringing us to to code. Unfortunately, this is where the good news ends. 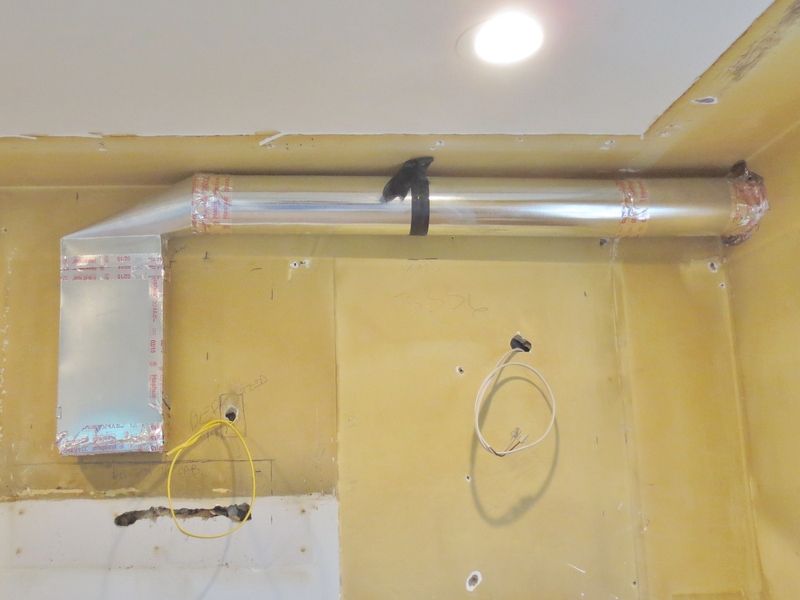 The HVAC person also came on Tuesday to install the outside vent and move the HVAC vent over a little bit to accommodate the tall pantry cabinet. Here you can see the new exhaust vent. It looks good from here, but in reality there is a hole in the side of it that needs to be plugged and the flashing around the exterior hole is not sufficient. There’s a visible hole in the brick that needs to be covered up. The HVAC vent is in even worse shape. 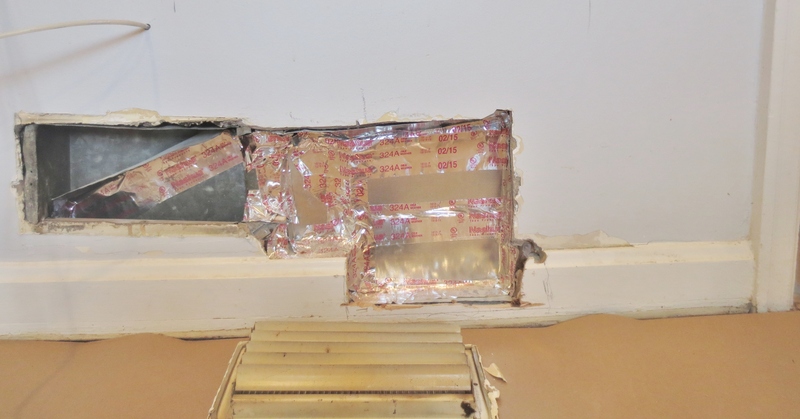 Instead of going up through the floor as we discussed with the contractor, they just tried to shift everything over inside of the wall, leaving only about a 2″ corridor for the air to go through. We’re pretty sure none of this is to code. We were very upset not only with the work that was done, (minus the electrical, those guys we great) but also that no one would came back at all this week to continue the job. The agreement was that not only would the electrical and HVAC be completed, but all the plaster/drywall patching would be done as well and that we would be “paint ready” by this weekend. As you can see, that’s far from the case. So tomorrow they are supposed to be back out here to fix the HVAC and patch the walls. Allegedly, we will be ready for paint by the end of the day. We are skeptical. However, we did go ahead and select the wall color so that we are ready whenever we are finally ready for paint. We wanted to find a nice, deep, ocean blue. 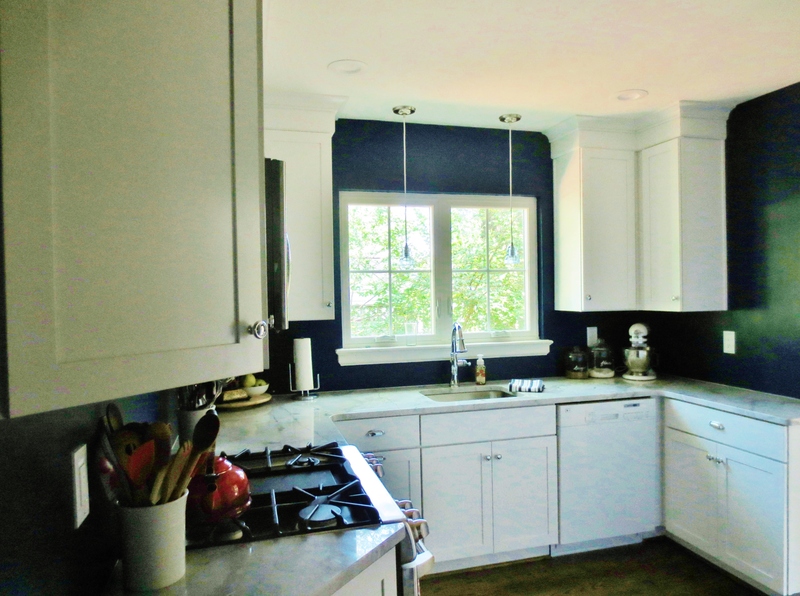 Since there is so much white in the kitchen, we thought it would be a nice contrast. We tried lots of samples. We were lucky that our friends had recently painted their nursery a similar color and had a few colors we could try in addition to the couple that we had picked up. Here are our choices. As you can see, some were darker and inkier than others. 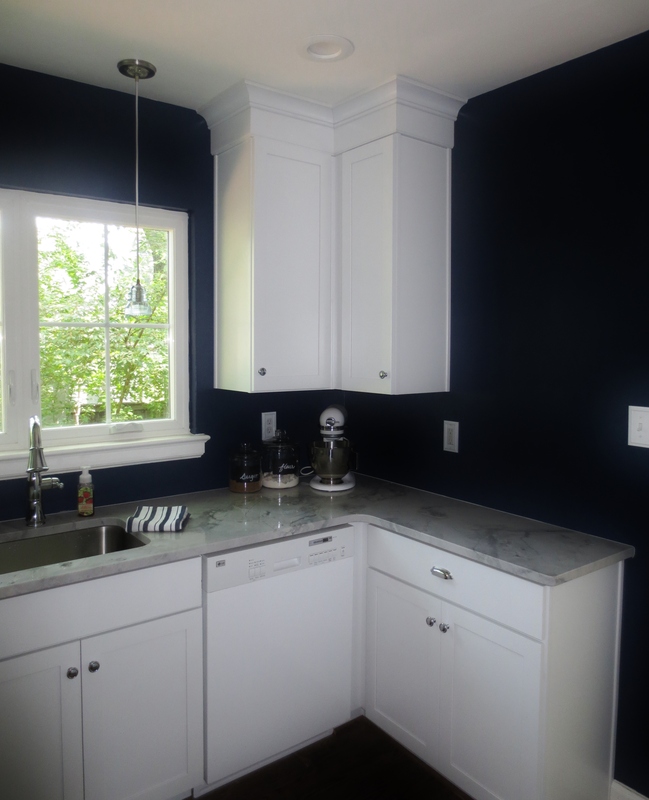 We wanted something that still read blue, even when the room was dark, but still had nice depth and felt like a navy. The one we chose was the one on the bottom right. It’s actually a combination of the bottom left (Down Pour Blue by Ben Moore) and second from the top right, which is Amalfi Navy by Ralph Lauren. We wanted something a little darker that Down Pour, which is coincidentally, what our friends chose for their nursery, and rather than go back out and hunt for the perfect sample, we just mixed our own until we got the color we liked, painted it onto a index card, and had the folks at the paint shop color match it. So that’s the latest on the kitchen. It was a disappointing week, but we are hopeful that things get back on track in a hurry. Right now the stone fabricators are scheduled to come on Wednesday to measure for the counters. 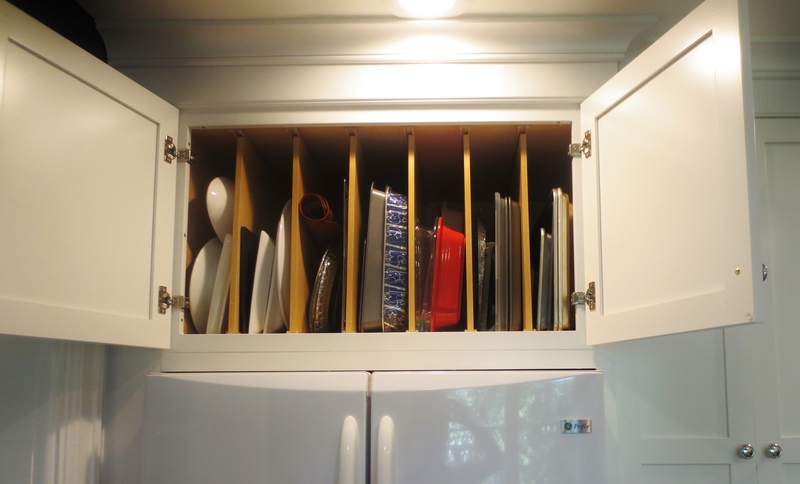 That means that by then at least all of the lower cabinets have to be installed. We both think it will take a miracle for that to happen, but we’ll see how things go tomorrow. I probably won’t be able to update again until next Sunday, so think good thoughts for us this week!